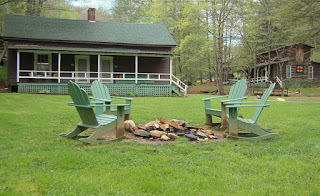 I thought that folks might be interested in hearing how we ended up with the Cabins at Healing Springs, so here is a somewhat brief history of how we came to own this little piece of heaven in Ashe County. A few weeks pass and we again come up to Ashe County for a weekend getaway and I had not stopped thinking about the sad little cabins on Healing Springs Road.....so here we go, I had to coax him into driving back down Healing Springs Road. It is now later in the year and all the leaves are off the trees, so you can really get a much better view of the cabins. This was not an encouraging sight....the roofs have holes, the doors have fallen off, the cabins are all sagging, they were all very pitiful. Of course, I want to get out and walk around using the reasoning that clearly no one lived here, so we could just peek in the open doors. We spent an hour or so walking about the property and peeking into the cabins and really taking a good look around them. All I can say in hindsight it that they did not look nearly as bad as they were! My partner in his usual fashion just shook his head and repeated his "oh, hell no!" statement a few times as I tried to get him to envision how cute they could be if we just put a little bit of elbow grease and time into them. I do recall that he suggested more than a few times that lighting a match would be the only thing that could help these cabins. We went back to Wilson, NC where we were living at the time, and I couldn't stop thinking about these sad little cabins. 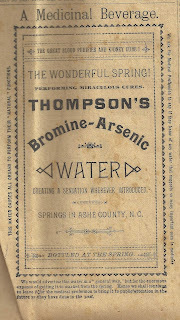 I did a whole bunch of internet sleuthing and discovered that the property was on the National Historic Register of Places as Thompson's Bromine and Arsenic Springs and that the spring had been discovered in 1883. 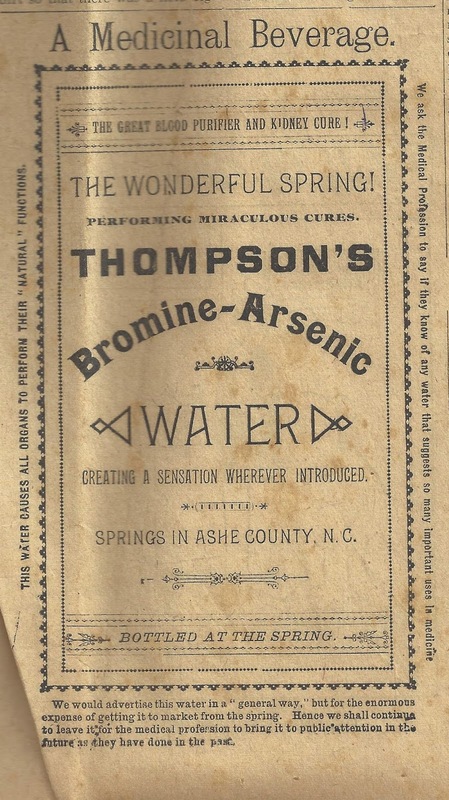 More research led me to all sorts of stories about the miraculous "healing" powers of the spring water and how it had once been touted as the 8th wonder of the world and exported all across the United States between 1889 and 1898 by Captain V. Thompson as a medicinal beverage. 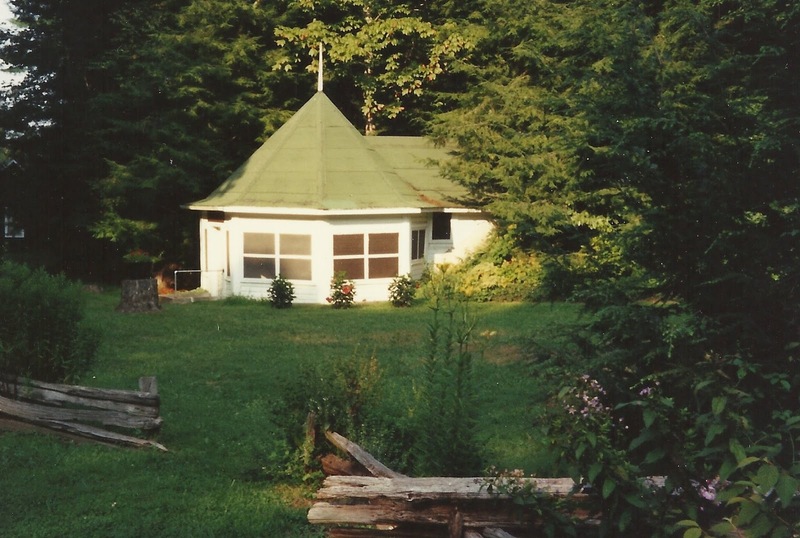 When we first started looking at the property, the spring house pictured above was still standing. Unfortunately later that fall a tree came down on top of it and damaged it beyond repair. We hope to rebuild the spring house just as it once was next year (2017) using historical lumber donated to use by some wonderful neighbors. I also learned of the hotel that Captain Thompson had built and how it was a long narrow building with rooms above and a great dining hall on the lower level. 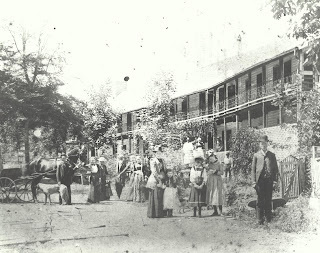 The hotel burned down in 1962, but many of the local folk remember it and have stories to share regarding the hotel. The hotel stairs are still here, but have fallen into the creek. In my continued research about the Healing Springs, I managed to find an address for the current owner, who was located in London, UK and wrote a letter asking if she would consider selling me the property as I was very supportive of historic preservation and felt passionately that this property could be saved and perhaps restored to it's former glory. Imagine our surprise when her agent here in NC contacted us and we started a dialogue about purchasing the property. Many more telephone calls, emails and several more visits to Ashe County later, we officially purchased Healing Springs in late January of 2014, and moved in in February of that year. For those of you who aren't familiar with February weather in Ashe County...it can be COLD! Single digit COLD as we learned. We moved into the building that is now the Lodge, but at that time was just a barn, but it had a roof that only leaked a little making it the most obvious choice as to where to live. Our first month or so was very rustic, no running water and the bathroom was 4 cabins away from where we "lived". Thank goodness for the water from the Healing Spring! We started work in earnest on the cabins with many visits by loads of local folk who were just positive that we are out of our minds and that there was no way the property could be saved. The number of people who insisted this property was "too far gone" was enormous. It was a steady stream of visitors for the first few weeks. Many of them mentioned that they had considered purchasing the property when it had been for sale in the late 1980's, but were daunted by the amount of work that it required then. At that point, we were still all excited about our purchase and very starry-eyed by the possibility of what we could do to restore the cabins. Months of work went by, long days, huge amount of effort and every single dime we could scrounge up went into the property and by July, we had a couple of cabins finished and were up and running with cabins for rent! Whoot! Whoot!! We continued working on the cabins, one cabin at a time and by August had most of them competed. We had started working on the ones in the worst condition first and that was a very smart move, because towards the end of that 8 months of hard work, we were tired and loosing steam. In hindsight, had we not started with the most challenging cabins first, we probably not be where we are today. We would have given up. This was a daunting challenge! Owl Cabin then and Owl Cabin today! We continue to make improvements and do anything we can to restore the cabins while keeping their original "feel" and "look", but with modern options such as on-demand hot water, gas logs in the fireplaces along with plush beds and cozy furniture. 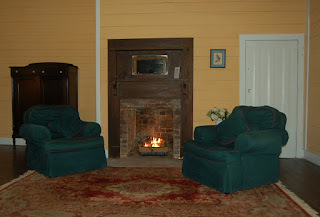 Our goal is to make Healing Springs a place that you come to rest, relax and rejuvenate!